Why do I build things? Most of the time it is pretty easy to figure out: I needed it and didn't have it so I built it rather than buying it. Building is far more fun even though it is often more expensive. I built my bed because I wanted a comfortable night's sleep. I built a chest of drawers to put my clothes in. Simple. The screen was built of black walnut as I mentioned, along with some very cheap &frac18;-inch luan plywood for the backing of the panels. I couldn't figure out any better way to do it with solid materials so I broke my rule against manmade materials. Both sides of the inserts are covered with heavy upholstery fabric. One is a faded-looking tapestry pattern and the other is a nubby medium brown. I realize now that the latter should have been lighter but it is too late now. The inserts are fitted into rabbets and held in place with ¼-inch handmade moulding with a half-round on one face which is mounted with that face forward to give a bead detail framing the fabric. The mouldings are mitered and held in place with brass escutcheon pins. 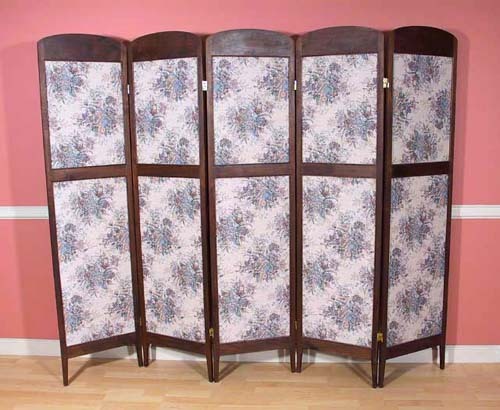 The openings on the back (brown) face are simply edged in a chamfer detail. 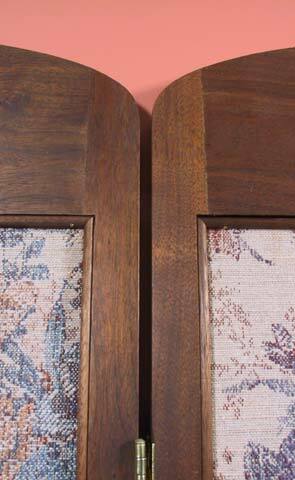 The rails and stiles of the panels are joined with deep ¼-inch mortise-and-tenon joints. Finish is in Danish oil which came out a little darker than I would have preferred but it did effectively cover up the two places where I had to dye a bit of walnut sapwood that slipped in. Overall size in inches: 80 X 72 X ¾.